There's no question this will be the most competitive World Matchplay ever. Tournament on tournament, the standard of our sport has been getting higher. In my day there were probably only four or five players who could win it, but nowadays there's a good dozen. I don't think it's totally wide open, but there are more people capable of winning tournaments than there used to be. When you see people like Peter Wright and Jamie Caven consistently averaging over 100 then there's no reason why they couldn't go on and win here. I don't think we'll see a shock winner, but it wouldn't surprise me if we did. 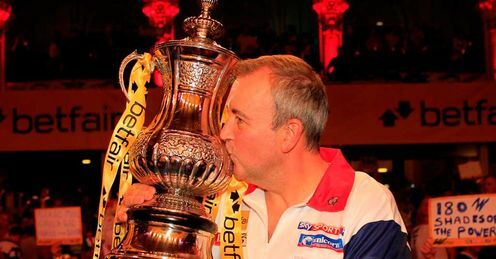 I still think Phil Taylor is the man to beat and is 3/1 with some bookies which has got to be worth a punt. It could be his year, but then you look at Michael van Gerwen, Raymond van Barneveld, Gary Anderson and James Wade and they're all in with a shout as well. And it was very pleasing to see Adrian Lewis win the European Championship. Everybody at the PDC has been waiting for him to get his form back because he's a major asset to the company. People say I don't like him, but that's a load of rubbish. The kid is great for this game and without people like him, darts doesn't grow as quickly. It was very pleasing to see him win the final against Simon Whitlock in style and I thought it was an exceptional game. There was speed, high scoring, big shots out... it really doesn't get any better. It's hard to do interviews when you lose a big final, but it was great to see Simon say that he'd given his best but Aidy deserved it and he hoped everybody enjoyed it. I can't imagine anyone didn't! There's so much drama in our game and when you add in the crowd atmosphere and the Sky Sports production then we can match any other sport.